Come and join us for Cider Stomp after Apple Day on Saturday 11th October. 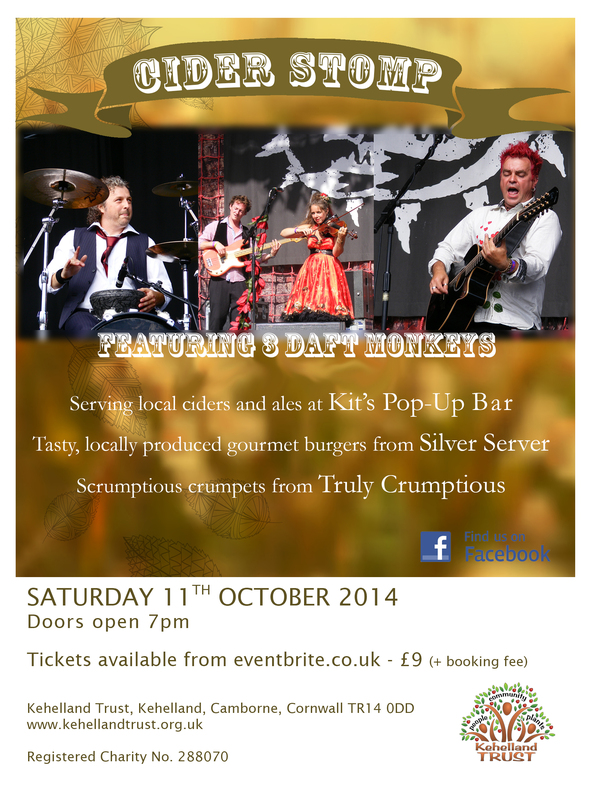 Live performance from 3 Daft Monkeys, scrummy local ales and ciders served at Kit’s Pop Up Bar, and delicious gourmet food available from the Silver Server and Truly Crumptious. With a new four piece line-up including percussion and three piece harmonies, frenetic fiddling and 12 string guitar, and with celtic and eastern influences, the 3 Daft Monkeys dynamic style of world-influenced folk music and infectious dancing rhythms will leave you breathless, enthralled and exhilarated. The desire to dance is irresistable! Tickets are £9 (plus booking fee) through eventbrite.co.uk – CLICK HERE.